How are Photos with Santa by Jordan Photography different from other Santa options? Where are you located in Town Center Plaza? Does your Santa have a real beard? Can I see a photo of what your Santas look like and when they are scheduled? What will Santa wear for my visit? Can we schedule an appointment to visit Santa? Why do you need a credit card when we schedule an appointment? What are the best times to visit Santa? Can we bring our pets in for a photo with Santa? If I’m coming with another family, do we need to book separate appointments? How much time do we get with Santa? What are some ideas of things we can do during our session with Santa? You can dress your child up in their Christmas best, pile on the hats and mittens or come in Christmas pajamas. How can we prepare a child that may be scared to visit Santa? What if my child is scared and wants to be nowhere near Santa? Can I order prints from more than one pose/image? Do you offer high-resolution digital images? Do you offer photo Christmas cards? Do we have to buy a photo? What is Sensory Friendly Santa? What if I have a question that is not on this page? Who can I ask? We are locally owned and operated. We are a portrait studio style Santa photo operation. We only hire professional photographers to take the photos. We are a professional photography company year around and not just during the holiday season. We train and pay our employees well to ensure they provide the best possible customer service experience. We are extremely selective of who we hire and are committed to offering the very best Santa photo service in our industry. Photos with Santa is located on the North side of Town Center Plaza, next to Macy’s. The address is 5065 W 117th St, Leawood, KS 66211. For Santa hours and more information about this location click on the LOCATIONS tab at the top of this website. We only use naturally bearded Santas and are extremely selective of our Santas to ensure they look the part. Our Santas have appeared in national television and print advertisements for companies like Garmin and Cabela’s. They can even be seen on an occasional Hallmark card. We have created a special SANTAS page on this site which includes the names and images of this seasons Santas. Santa wears his traditional red velveteen sleigh wear. Check out the GALLERY section of this site for pictures of Santas outfit. Yes, the days of waiting in interminably long lines with a restless child are over! You can schedule an appointment to visit Santa using the SCHEDULE tab at the top of this site. This 3-5 minute photo session creates a system that gets you in and out and on your way. A credit card is required when scheduling an appointment. You can cancel your appointment online up to 24 hours before your scheduled appointment without being charged a cancellation fee. Late cancellations or No-Shows are subject to a $25 cancellation fee. Appointments are available Nov. 20th through Dec 23rd. The credit card is required in an effort to discourage double-booking appointments and no shows. You can cancel your appointment online up to 24 hours before your scheduled appointment without being charged a cancellation fee. Late cancellations or No-Shows are subject to a $25 cancellation fee. We understand things come up, illness, weather, etc. As soon as you know you are unable to make your appointment we request you cancel your appointment online. All appointment confirmation emails will contain a cancellation link. You can cancel your appointment online up to 24 hours before your scheduled appointment without being charged a cancellation fee. Late cancellations or no shows are subject to a $25 cancellation fee. If available, you can reschedule for another day and time. We do everything we can to try to fit families in if we have any cancellations. November and early December are the best time to visit Santa. The closer to Christmas the busier Santa gets. Yes, you can bring your pet into the Town Center Plaza location any weekday between November 20th and December 15th. Appointments are required. Scheduled sessions allow us the opportunity to prepare for you in advance. When you arrive, please meet our staff at the door and let them know you have a pet. We request that your pet wait outside until their turn. All pets are welcome but must be secured on a leash, in a carrier or held by the owner at all times. For everyone’s safety, please do not bring your pet if they have a history of biting or aggression with people or other animals. If you are seeing Santa separately or together it is best to book different appointments to make sure Santa is able to spend quality time with each child. Appointments are scheduled in 5 min increments so most likely you can see Santa close together. Each session will last between three and five minutes. Appointments are scheduled in 5 min increments. This will give your little one(s) time to interact with Santa. The closer to Christmas the busier Santa gets and is not able to spend as much time with each child. 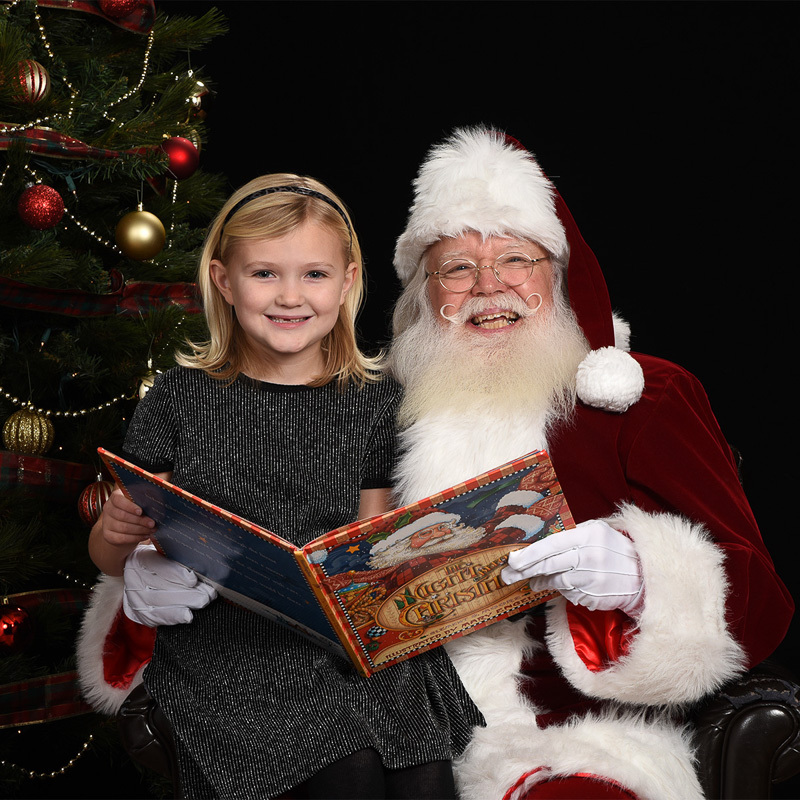 Your child can bring a wish list to share with Santa. Santa may show them pictures from our Christmas book. You can even bring their Elf On The Shelf for a few photos. You want Santa to be a good experience for your child and help them over any anxiety they may have. The key to overcoming Santa-induced stress is talking about what to expect. Explaining and describing what Santa looks like, and telling them that they don’t have to go up alone can help them feel prepared. It’s important to make it clear that if they get in the studio and change their mind, that’s OK. If a child wants to be nowhere near Santa, let them know there are other ways to get in touch with Santa such as writing a letter or draw a picture. Be sure to let your children know Santa will still get the message. Peek A Boo Santa Sessions work great for children that are scared and want to be nowhere near Santa. Click on the OPTIONS tab at the top of this site for sample photos and more information about our optional Peek A Boo Santa experience. Click on the PRICING tab at the top of this site to see our prices. We have many print combinations available which include multiples of 4 X 6, 5 X 7 and wallets. We take several photos during your visit with Santa. You may add poses/images to any package for an additional charge of $3 each. This does not mean that you are getting any more than what is included in your package. Immediately. A professional photographer will take your photos with Santa, one of our staff will show you your pictures and after you place your print order your prints are ready within minutes. We do offer digital files. They are included in some of the packages or you can purchase the digital file alone. The purchase of digital files come with a “permission to print” release allowing unlimited reproductions for personal. Yes! We most definitely do. We have several fabulous card templates to choose from and each card comes with a mailing envelope. After you place your print order your prints are usually ready within minutes. Depending on the number of cards you order, you can wait for them to print or come back at your convenience to pick them up. We respectfully request that you refrain from using personal photographic or video equipment. Personal photos or videos are not permitted during professional photography sessions. Professional photographer will end the photo session if personal cameras or camera phones are used. Videotaping is not permitted in the session at any time. We appreciate your cooperation and wish your family a very Merry Christmas! Visits with Santa are always welcome. There is no obligation to purchase a photo. Certainly. Obviously, we are somewhat limited by the overall space, but we will always try to accommodate your group. If scheduling an appointment, each family should have a separate appointment. Group photographs can be accommodated as long as both families have booked appointments back to back. Sensory Friendly Santa is a program designed to allow children with autism or sensory processing disorders to visit Santa in a safe and calm environment. This program is a joint effort between Jordan Photography, local autism societies and organizations. Please call us at 913-814-7740 or email us at email@jordanphotography.com and we’d be happy to answer any questions you may have.